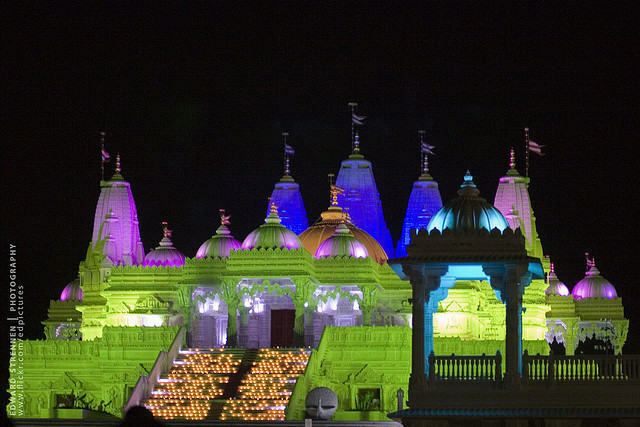 Neasden's landmark Hindu temple, BAPS Shri Swaminarayan Mandir, hosts the largest Diwali and Hindu New Year celebrations in the country. Open to one and all, the celebrations feature a Diwali ceremony, Chopda Pujan, conducted for the closing of the previous year's accounting books and the starting of the ones for the new year, followed by a fireworks display on Friday. On Saturday the Hindu New Year celebrations feature Annakut - 'a mountain of food' artistically arranged for the deities in the main hall, and Rajbhog Arti (ritual offerings) every half hour. Traditional Indian food will be available on both days from stalls. Hot delicious snacks will be available on both days. Where is BAPS SHRI SWAMINARAYAN MANDIRat, London located?